Yum’s The Word Side Dish…. Yum’s The Word Side Dish! Folks, Thanksgiving is going to be upon us before you know it….Today is the 4th of November already…How did that happen? I have been thinking side dishes for a couple weeks now….searching out my cook books for something different, but still traditional. I poured over the pile of cookbooks scattered across my desk and spotted one of my Amish Cookbooks and I thought….how traditional could one get? And I found it! A perfect side dish! 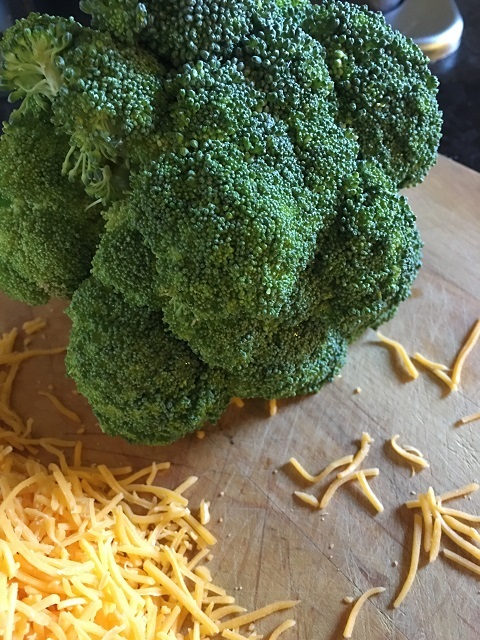 I love broccoli…..yes, it may sound strange but I do love this bright green veggie. I also like cauliflower, especially when they are both used as crudites ….I really like dipping my veggies in a creamy dip or a vinaigrette. So mixing the two together just needed to happen to make my taste buds soar. Believe me, my mouth was watering when I first spotted this recipe and I just had to make it. You understand don’t you? 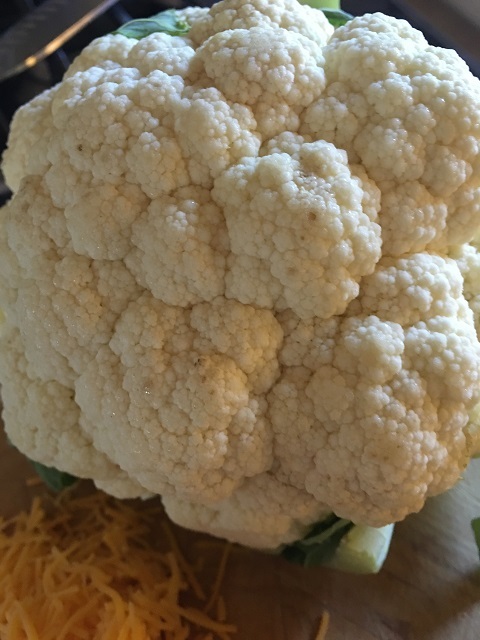 I just couldn’t resist….. especially since I had just been to the Farmers Market and that nice white head of cauliflower and Forest Green head of broccoli on the Farmer’s table now rested in my fridge. If you are puzzled by this urge I had….think about seeing freshly made chocolate chip cookies and a glass of cold milk on your television screen….and the urge to run (not walk) into your kitchen and mix up a batch. 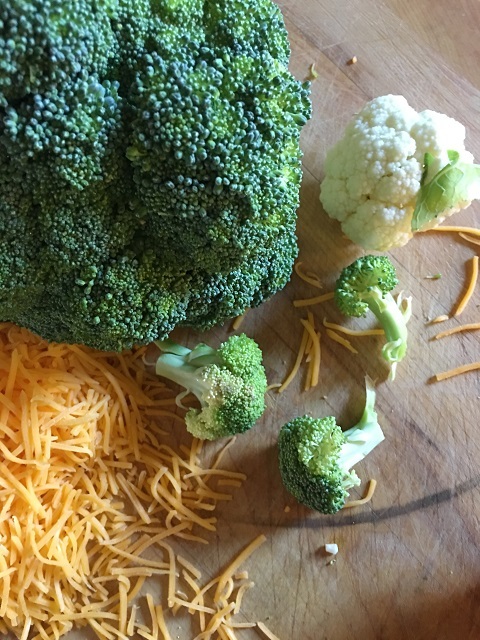 Granted this is veggies….and not the same thing as chocolate….but still, if you are a veggie lover…well, you get the picture. 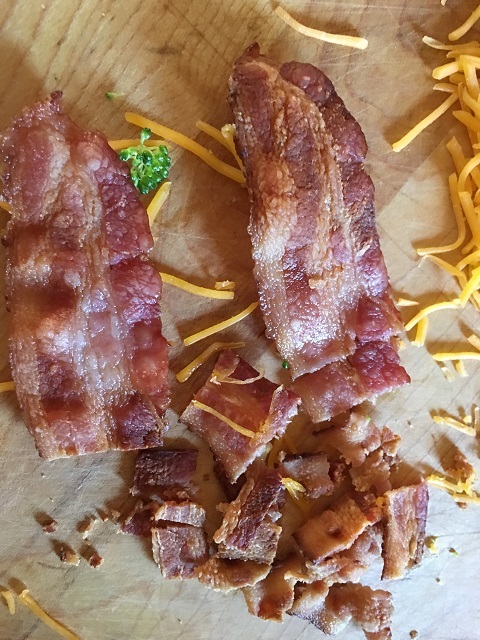 Granted, the bacon may just put it over the top of “healthy”…and it is optional, but why wouldn’t you want to add it? 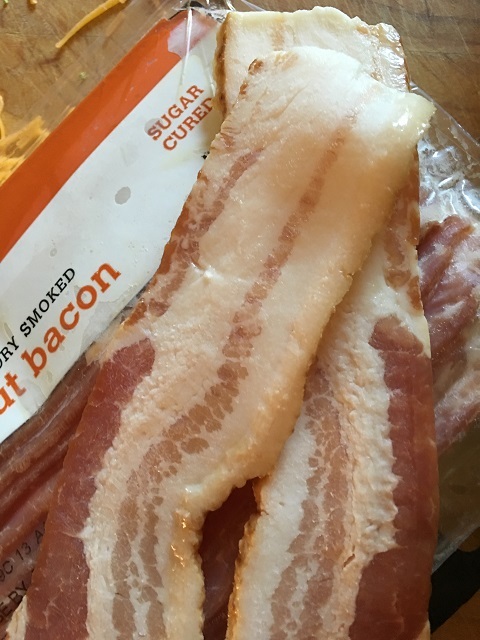 I mean, everyone loves bacon, am I right? All this recipe needs is a roasted turkey, cornbread dressing and creamy mashed potatoes sitting along side it. This is definitely a November Dish. Obviously! This is a great side dish! 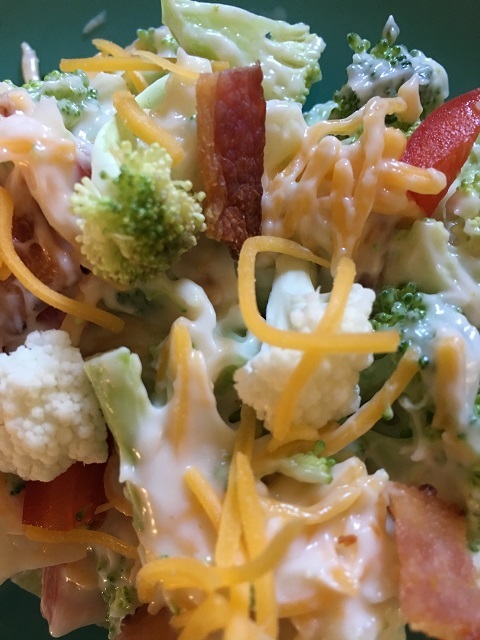 Healthy veggies tossed with a bit of sugar, mayo and sour cream and just a wee bit of shredded cheddar cheese and bacon thrown in. YUM-MY! Oh, confession time….I prefer Miracle Whip to Mayo….but the choice is yours. However, if you really want to give this salad “zip”…then use the Miracle Whip. My dear readers…in my opinion, this is the perfect side dish for your Thanksgiving feast. Sit it along side your green bean casserole or scalloped corn or fruit salad….you know what I am talking about! This salad is so easy to throw together and the taste is wonderful. 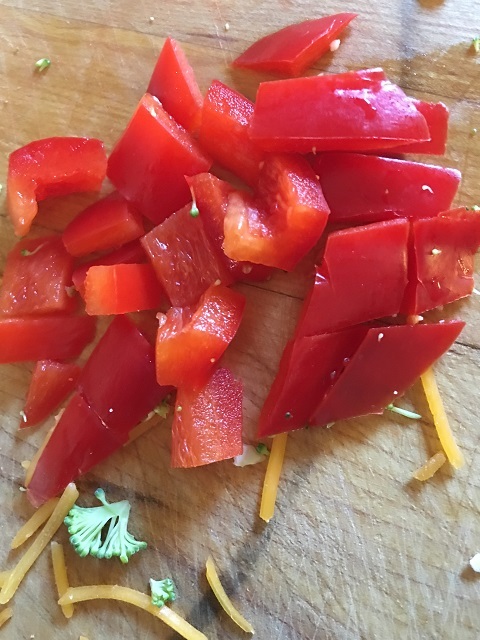 The bell pepper and sugar give just a hint of sweetness to these healthy veggies. 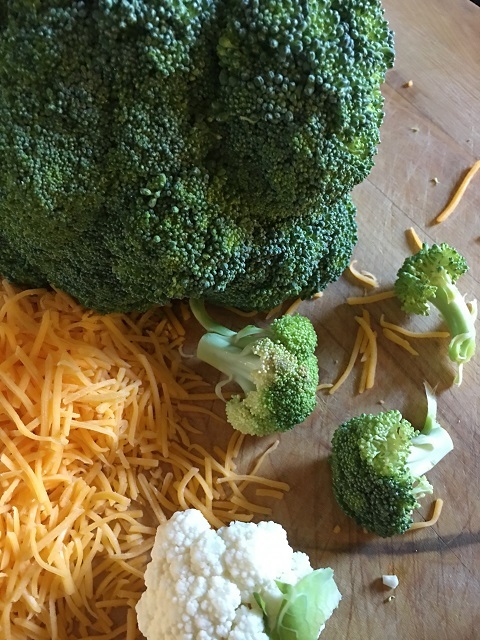 Add cauliflower,broccoli, red bell pepper, bacon and cheese to a medium size bowl. I too am a veggie lover. This is mouth watering. It will make a beautiful Christmas side, too. Thanks for recipe. You are most welcome….thank you for stopping by. I am loving the pics of you, Jane and Diane! What fun you girls are having!